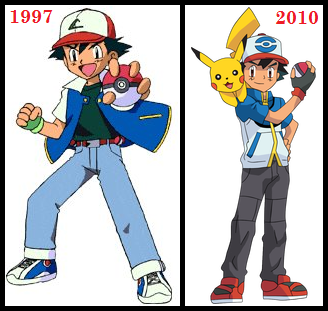 By never growing old, I mean the anime has been airing for a long time, but the character never grows old. I think the most popular example for this kind of character is Ash Ketchum from Pokemon and Nobita and his friends from Doraemon. (Yes, I do realize that both anime are for kids - I don't remember any other example that the character never grows up for a long time). However, most characters from long-running anime that I know of always grow up, like those from Dragonball, One Piece, Naruto, Fairy Tail, and Shin-chan. (The last one I mentioned has similar traits to Pokemon and Doraemon, although I'm not sure Shin-chan is for kids). Any reason behind this? The creator of Pokemon wanted children watching the show to be able to relate to the main protagonist, Ash/Satoshi (personally I believe the protagonist is Pikachu). Keeping the character around the age of ten is a good way to get kids that will be this age (ten) soon to watch the show. A possibility is that the time leap between episodes is short. In Pokemon's case, there are about 887 episodes, but the time span between the episodes is never revealed. If each episode occurred back to back, only about 2.43 years has passed since the first episode occurred, which is a short time for some people to physically change. Another example is Detective Conan, which currently has 787 episodes. If each episode occurred back to back, about 2.15 years has passed. This is relatively short, especially for grade-schoolers, to change physically. There are a couple exception, and one of them is Doraemon. Doraemon has more than 2000 episodes and even if each episode occurred back to back, more than 6 years has passed. For ones like these, the only probable explanation is that the author wanted to keep the characters young to appeal to younger audiences.